If you think your commute is bad, wait until you see the chaos traffic faced in Montreal. A snow and ice-covered road led to a slippery situation for numerous vehicles, including buses, cars and even the police. 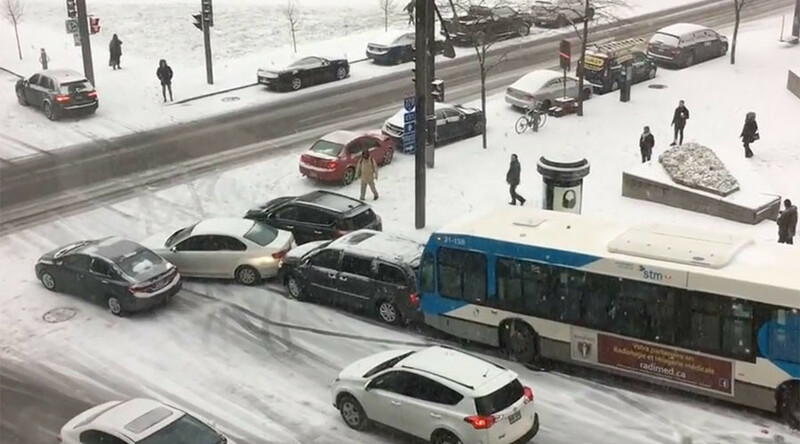 Footage filmed at the intersection of Beaver Hall Hill and Viger Street on Monday shows the many, many slow motion pile-ups that occurred on the icy road during the morning. A city bus slowly careers into two cars stopped at a corner, pushing them along as three more cars on the road end up caught in the collision. A pick-up truck then slides into the back of the bus, the impact causing the ladders in the back of the truck to shoot into the air and the bus to roll into the car stuck in front, creating a chain of vehicles. Later in the video, another bus ends up colliding with the pick-up truck, causing the car at the front of the chain to slide across the junction. The bump causes the pick-up truck to slide out of the vehicle conga line to the other side of the road. Colin Creado, who works on Viger Street, spotted both buses colliding on his way to work. “The bus was full of people, and it couldn't stop. It crashed into the other bus," he told CBC. Another scene taken further up the sloping street shows a bus slowly slide sideways across the road as onlookers watch. A police car is also seen slowly sliding backwards down a road, its lights flashing helplessly. The video flips to a different perspective to show the police car join the two buses and one car pile-up, its back banging against the bus. "I could see the cop car literally jump in the air,” Credo said. “It was pretty powerful." Even a sturdy snowplow is no match for the icy road, as it too ends up in the pile up, its plough almost crushing the police car. The video, which has been viewed more than 415,000 times on YouTube and 18 million times on Facebook, was taken by Willem Shepherd and his colleagues, who filmed the pile-up from their office. It was edited by Ara Pehlivanian who put the different camera perspectives together. “Even car crashes are friendly in Canada,” one YouTube commenter said.